Kyle Bursaw – kbursaw@shawmedia.com A portion of Airport Road was down to one lane as a fallen tree spilled into the road in Sycamore, Ill. on Tuesday, July 24, 2012. 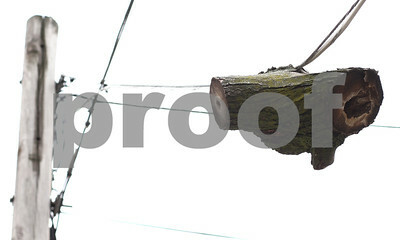 Kyle Bursaw – kbursaw@shawmedia.com A piece of tree hangs suspended from a power line on the 200 block of North California Street in Sycamore, Ill. on Tuesday, July 24, 2012. 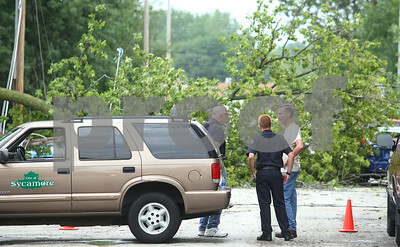 Kyle Bursaw – kbursaw@shawmedia.com Vinnie Laudicina (center) and Lieutenant Paul Rubeck (right), both from the Sycamore Fire Department, talk with a property owner while stationed to keep people away from the downed power lines on the 200 block of North Cross Street in Sycamore, Ill. on Tuesday, July 24, 2012. 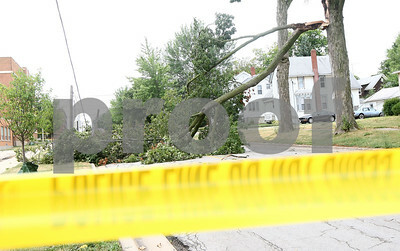 Kyle Bursaw – kbursaw@shawmedia.com A tree branch, that brought some power lines down with it, lays across the 200 block of North California Street in Sycamore, Ill. on Tuesday, July 24, 2012. 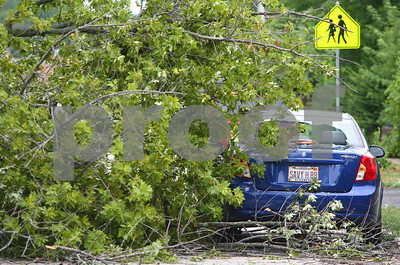 Kyle Bursaw – kbursaw@shawmedia.com Savannah Brey's car received damage from a downed tree across the 200 block of North Cross Street in Sycamore, Ill. on Tuesday, July 24, 2012. 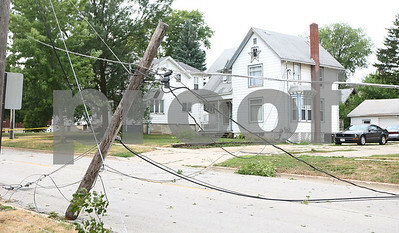 Kyle Bursaw – kbursaw@shawmedia.com Power lines lay across the 200 block of North California Street in Sycamore, Ill. on Tuesday, July 24, 2012. A portion of Airport Road was down to one lane as a fallen tree spilled into the road in Sycamore, Ill. on Tuesday, July 24, 2012.